The striking Windsor Shiplap Offset Apex Shed has an attractive, traditional design. The roof has a blended apex and pent style that gives it an unusual yet stylish look. Created from 12mm Shiplap tongue and groove, the walls are exceptionally strong and naturally resistant to the elements. 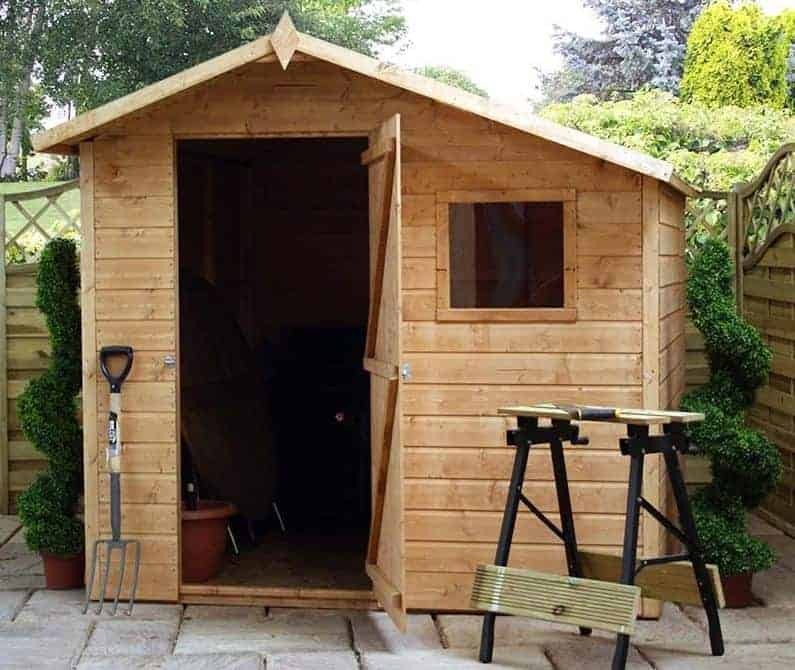 A wide, single braced door ensures you have a spacious entry to the shed; allowing you to get wider tools and equipment into the building quickly and easily. The interior is made from weaker solid sheet materials, though there are ways you can add additional strength to the floor to improve its longevity. One positive thing about the interior is the round edge framing. This offers additional moisture resistance and boosts structural stability. A small, fixed styrene glazed window can be found at the front of the shed. It provides a good amount of light into the building, whilst still giving it a more private design compared to other similar size sheds. A pad bolt secured to the sheds door gives you the opportunity to keep it padlocked, though this will need to be bought separately. A 10 year anti-rot guarantee is also provided, though this will only apply if you keep up the annual treatments required. Solid sheet floor may need to be upgraded to accommodate heavy storage. This is one of the more unique storage sheds in the Windsor collection. Its offset design gives it an extraordinary look that will complement any garden. Like all apex sheds it comes with a substantially high roof, giving the interior a much taller design. The height of the door is average, though the width is slightly wider which makes this more comfortable to access than some of its competitors. 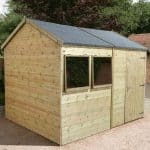 Whilst advertised as a 7’ x 7’ shed, the actual measurements including overhang are important as it tells you how much space should be left around the building when erecting it. The unusual offset roof is perhaps the most significant feature of this shed. It changes the entire look of the building, whilst also providing exceptional weatherproof features. As rainfall hits the roof, it is directed diagonally down both sides of the building, prevented from soaking through into the wood thanks to the included felt. Though this felt isn’t the thickest and most durable, it still adds an extra small layer of protection. We do feel the fact the roof and floor are built with solid sheet lets the shed down somewhat. Whilst it is common to find this type of floor in many modern sheds, it is known to be particularly flimsy. So it therefore won’t do well with heavyweight storage. Adding bracing underneath the floor or another sheet of wood on top can rectify this but that will mean spending more and you’ll also need minimal DIY skills. Thankfully the outside of the shed has a much higher quality than the interior. It is built from high quality tongue and groove Shiplap. This provides numerous protection against the elements including a small channel between every panel to drain water away from the walls and a tight interlocking snug fit that prevents drafts. There is also a little gap between the panels which is there to protect the structure if shrinkage or swelling occurs due to changes in moisture or temperature throughout the year. Standard framing is used, though it does benefit from round edges which is moisture resistant and enhances the stability of the structure. Like so many sheds offered on the site, this has been dip treated. That basically means the wood has a surface layer of water-resistance. 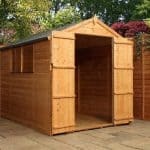 It doesn’t mean that you can skip any further treatments however, If you want to make sure the shed is protected by the 10 year anti rot guarantee you will need to treat the shed both after assembly and annually. The door is placed on the tallest part of the building and cannot be moved due to the offset roof design. It provides the focal point of the shed and comes with a strong, braced style. It also has a pad bolt to make sure strong winds do not blow the doors open. As you can see on the picture, it offers a good, convenient level of entry space and has a tall design. The window on the other hand is smaller than you will find on most sheds. Styrene glazed, this fixed window offers a small amount of light into the building. Its compact size also adds to the character of the shed and gives it more of a ‘playhouse’ design. We would really have liked to have seen this shed come with a padlock. It has a pad bolt but a padlock does need to be bought separately. So as sold, the security of the shed is virtually non-existent. The privacy is slightly better than what you find on most sheds with windows included. It is a small window so it’s going to be hard for someone to peer in and see everything that is stored. However if you are still concerned you do have the choice to install a blind. This wouldn’t just increase the privacy, it would also help you to add more personality to the building. Due to the unique design of this shed, there aren’t many customisation options available. However, one way to change its appearance is through the coloured treatments on offer. 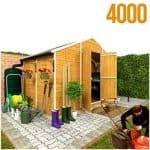 Shed Store give you a choice of four unique colours including Ivy Green, Cedar Red, light or dark brown. They have been uniquely designed so that they are safe to be used around pets and plants and they can be applied with a paint sprayer for quicker application. You’re also given the option to use the garden building installation service. You should find it isn’t too difficult to assemble yourself, but this service does save a lot of potential frustration and time. Just be aware that if you choose this option it will not include the assembly of a base kit if you plan on using one. We would have loved to have given this shed a 10/10 rating for quality due to its attractive design alone. However, we do need to take into account that its interior is constructed from solid sheet, rather than tongue and groove. The majority of the shed has an exceptional quality design, created from high quality materials. However its interior isn’t as durable as some other competitor models and it also needs annual treatments to ensure it lasts the 10 year warranty provided. Though a little smaller than the most popular 8’ x 6’ sheds, this one does still offer a lot of storage space. It should fulfil most people’s storage requirements and don’t forget you can also add shelving too. This is going to be more challenging to put together than your standard apex shed. However, full instructions are supplied and if there are two people assembling it you shouldn’t run into any problems. 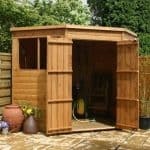 You are benefitting from great value for money with this shed, largely due to its very uniquely attractive design. 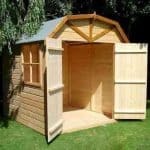 Final Thoughts: This medium size attractive shed is an excellent choice for those seeking something a little different. Thanks to the offset design, it benefits from a traditional style with a modern twist. The large wide door has been braced for maximum strength and it is pad bolted to ensure the doors do not fly open in strong winds. A 10 year anti rot warranty provides peace of mind that the shed is built to last. However, it will require yearly treatments to maintain its weatherproof design. 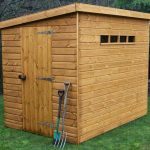 Overall it is a good quality shed with a range of great features and it is offered at a very reasonable cost.